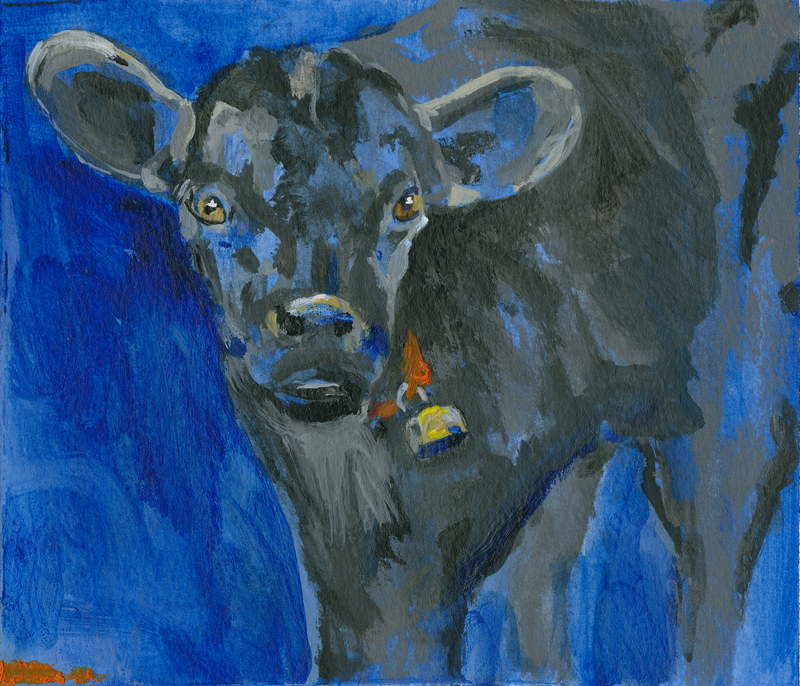 I finished six paintings which will illustrate a book of poems to be published next year titled, A Crop of Riddles©. In it, the author Jack Veeger reflects on his long life of 85 years. His daily routine is to sit at his desk, pen in hand, ask himself questions and voice his opinions through the written word. His words, to me, are akin to a songwriter’s lyrics because of their easy flow. Below are the paintings that will be scanned and digitally submitted to the publisher. Unlike most of my paintings, the project came with guidelines about certain dimensions required for book formats. Scale considerations are of utmost importance when print is involved. Here’s the title page. The question marks front and center seemed appropriate for this collection of poems. 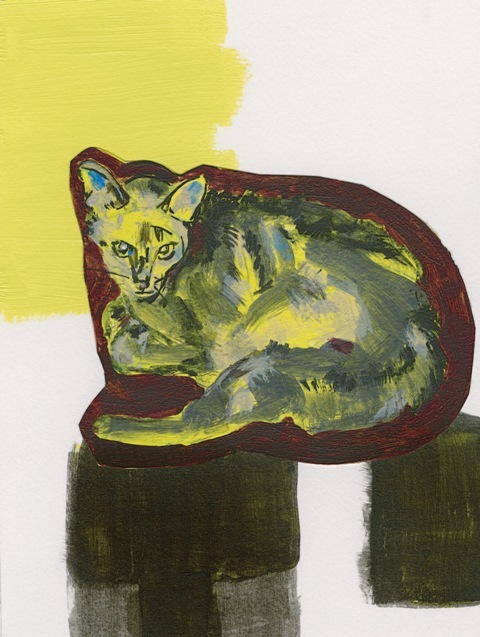 My Blue Silver Abyssinian cat, Tobit, was the subject matter used for illustrating the poem, “Hush.” A verse talks about a gently purring, very custodial cat. 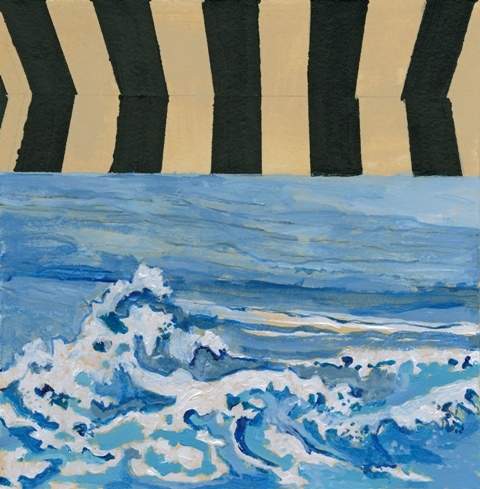 For “Taming of a Boisterous Sea,” photos I took of the Atlantic Ocean crashing on rocks below a patio terrace were the source for this painting. 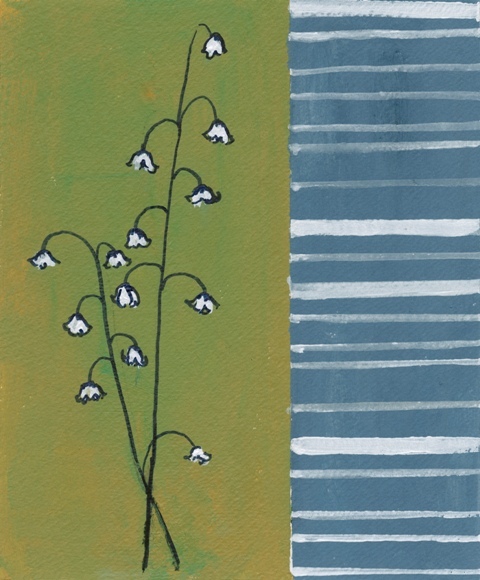 For A Heaven of My Own, the line about “ferns and moss and Lilies-of-the-Valley” inspired a line drawing of that fragrant flower. 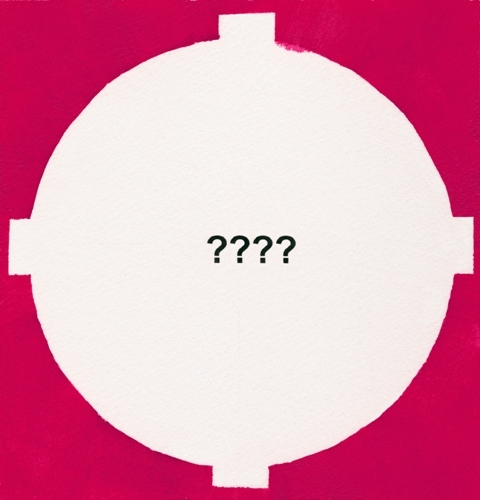 Plus, the poet’s European background conjured graphic images of Bauhaus and a Mid-century Modern aesthetic which inspired the color and composition of this illustration. 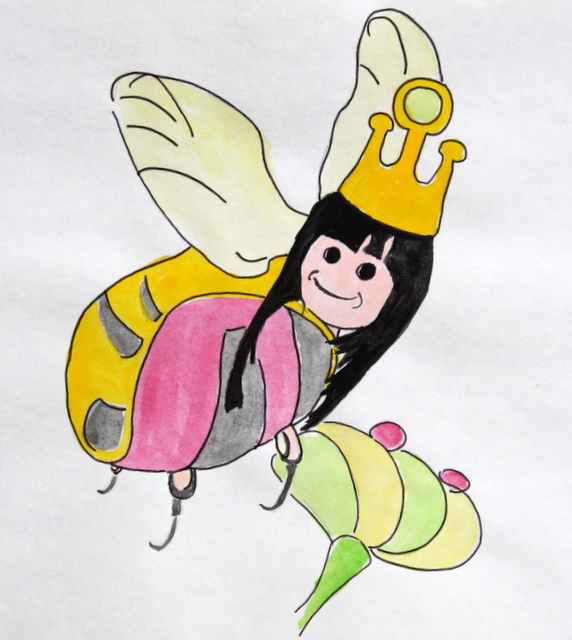 Illustrating Books – How to Start? My source of inspiration was the author’s granddaughter, Bridgett. Her sparkly, dark eyes and hair – both almost jet black – and facial expressions were the starting point for the paintings. Then, I used the images Uve’s words conveyed. Most described Mother Nature along the rocky New England coastline that surrounded his family and him – the sights and smells of the seaside, its tides, shells, ladybugs and snails. 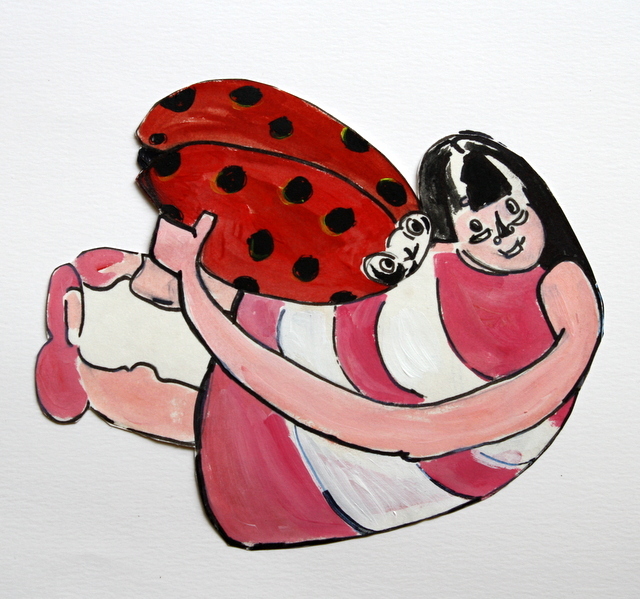 Now, I’ve been commissioned to illustrate another book of poems. Once again I ‘m deciding on the best way to translate the author’s words into images. So, I decided to spend this Saturday at the Dallas Museum of Art (DMA) to get inspired. The museum held BooksmART, a daylong festival for kids, families and adults to hear authors and illustrators talk about their books and how they create them. Featured guest and winner of the 2012 Caldecott Medal for A Ball for Daisy, Chris Raschka invited kids to join him on the stage and act out his stories as he read this book. 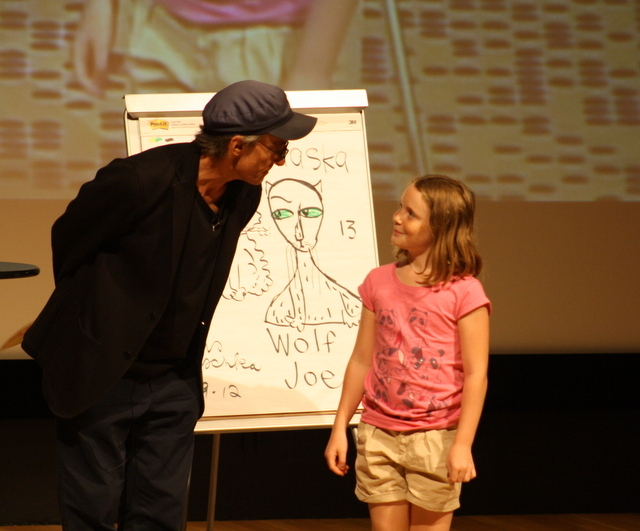 Chris Raschka welcomes a young admirer to the stage after he drew images of his two cats, Alma and Alaska Wolf Joe which are behind him. Known for his role on the TV series, Private Practice, Taye Diggs teamed with illustrator Shane W. Evans, recent winner of the 2012 Coretta Scott King Book Award, to create the popular book, Chocolate Me!. Shane (see below) gave a drawing demo, and then instructed the children who packed his workshop to draw stars and dreams of their imagined future. 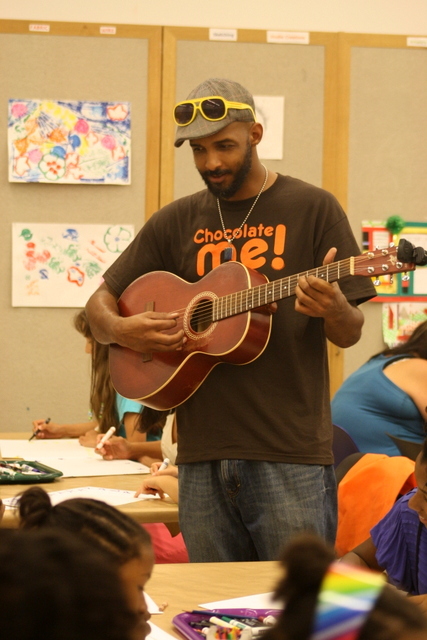 Shane Evans, co-author of Chocolate Me!, serenades the kids and families as they draw. 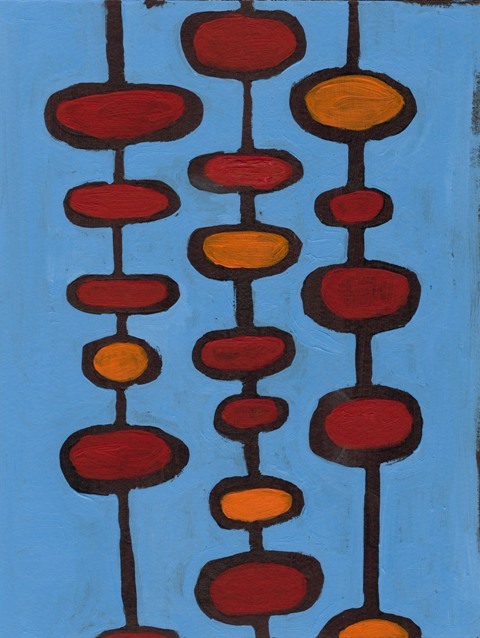 For the next two weeks I’ll be finishing the paintings – six in all – for the book, A Crop of Riddles. Fifty poems, in total, explore an 85-year old gentleman’s musings about a world and life full of so many questions and so few answers. His sharp intelligence, mature age and European background have nudged me towards sketching and layering images with a mid-century modern aesthetic in both color and design. 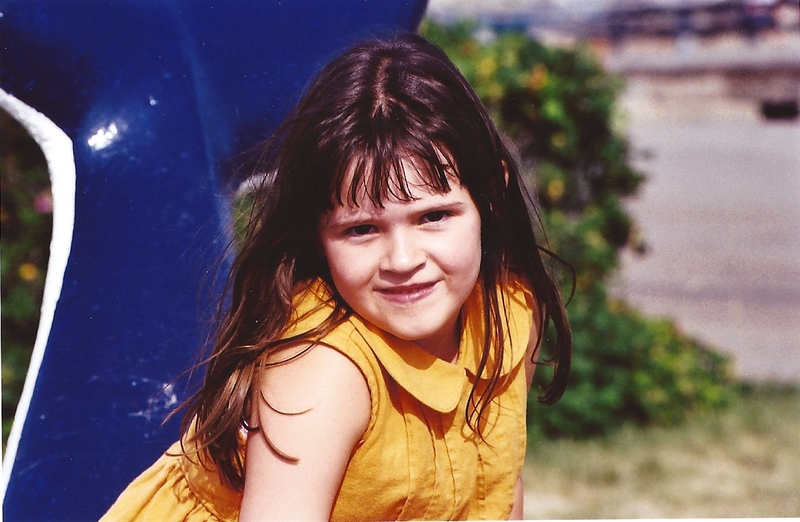 One poet, Uve Friederich, M.D., inspired me to create a world of childlike delights. Another poet this time has led me to series of compositions with a very different style. 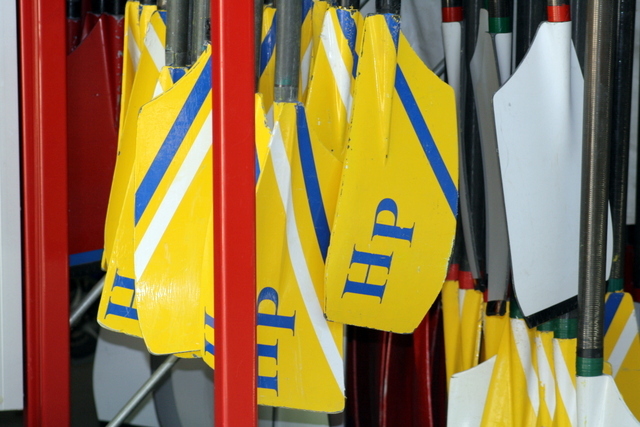 Next blog post will be examples from this particular journey. Until next time in two weeks, Sunday, June 23rd. PS: I did see Moonrise Kingdom and recommend another beautifully filmed, soundtracked and edited Wes Anderson film. He stays true to his quirky exploration of outsiders looking in. 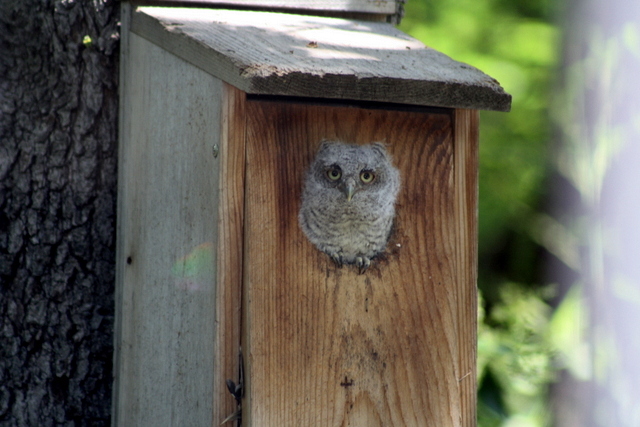 My little Eastern Screech Owl has flown the coop from the confines of his (or her) tree house. Adolescent Eastern Screech Owl peeks into my studio. This was the last time I saw my friend before its flight. 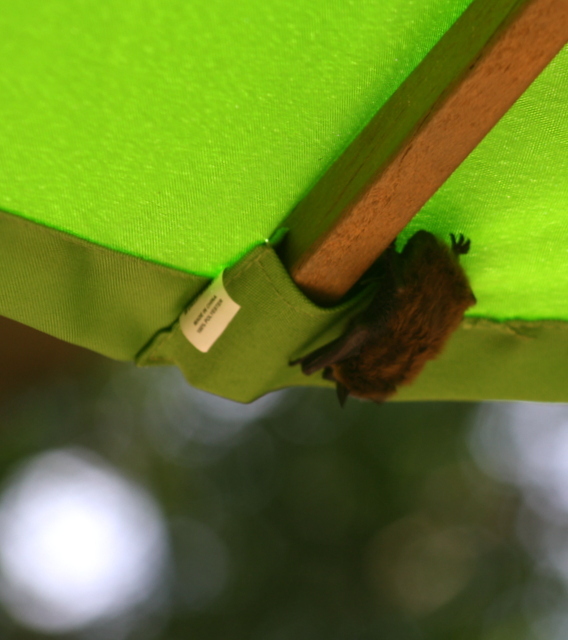 Replacing owl sightings, I discovered this little bat napping under the patio umbrella outside my studio. 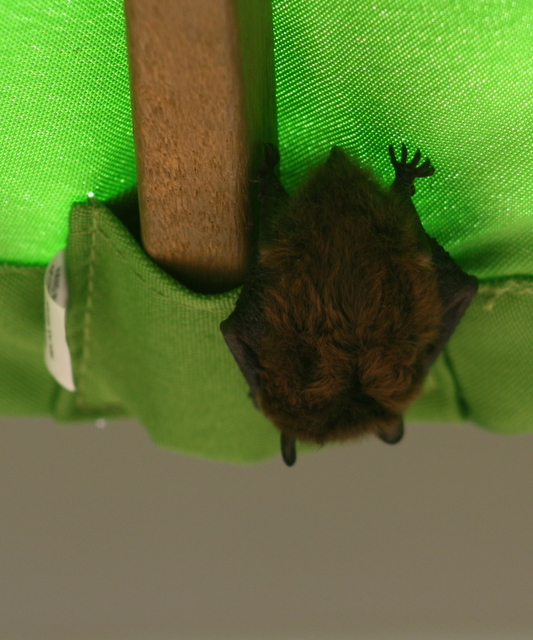 Close-up beauty shot: bats do sleep upside down. 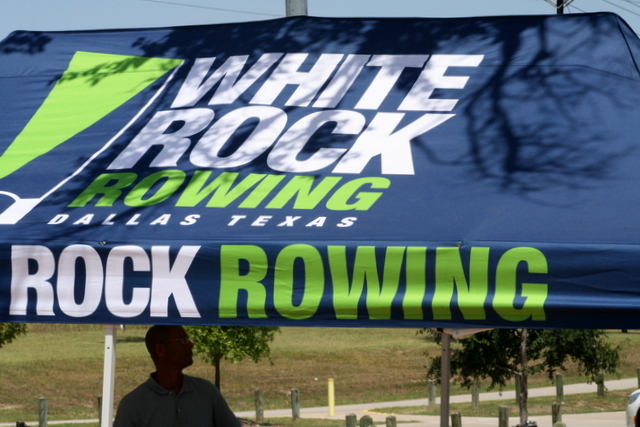 On Saturday, the City of Dallas hosted its annual Water-wise lectures and landscape tours. Four residences won recognition for their use of drought-resistance plants. These garden yards, plus 14 winners from previous years, were open to the public. 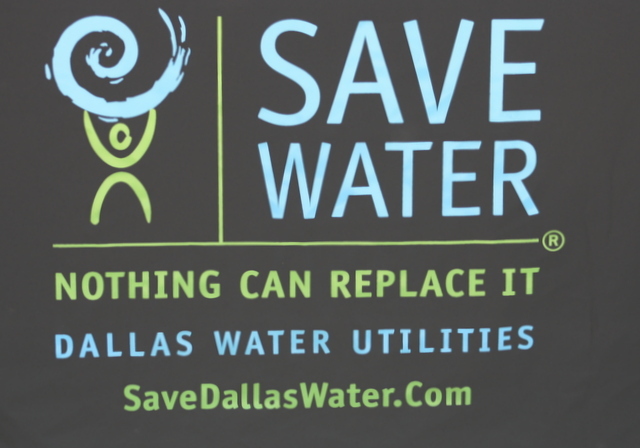 City of Dallas promotes xeriscaping to save water. 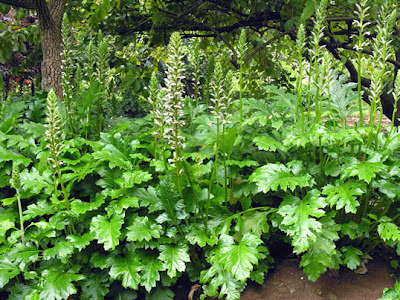 “Bear’s Breeches” (acanthus mollis) do well in the shade of my backyard, and are considered a “water-wise” plant. Its acanthus leaf pattern was used in classic architecture design to cap Corinthian columns. 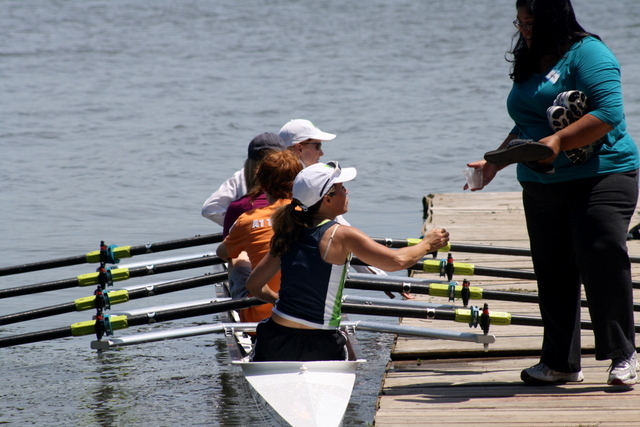 Also on Saturday, the White Rock Rowing Club threw an open house where folks could row in shells, test the water (so to speak) and join the club. This is much harder than it looks. Believe me, last time I tried and got quite wet. Summer blockbusters are part of my routine. (Note: I don’t need hot days to see a flick. Movies rule regardless of the season or temperature.). Over the long Memorial Day weekend, I enjoyed Men in Black 3. Josh Brolin joins the franchise and morphs seamlessly into a young Agent K, doing a spot-on mimic of Tommy Lee Jones’ voice, facial expressions and body movements. Next on my list are Snow White and the Huntsman, and some smaller, more subtle films like The Intouchables and Wes Anderson’s Moonrise Kingdom.